How Did I End Up Working in Antarctica? I was always under the impression that only U.S. Navy and Air Force personnel were eligible to work in Antarctica. However, during the spring of 1996, I happened to run into an old friend of mine, Steve Jackson while we both were attending our union's continuing education facility out in Scottsdale, Arizona. Steve told me that he had worked at McMurdo Station a number of years previously. Since it seemed that my seagoing career was all but over, I got the address for .Antarctica Support Associates (ASA) from Steve and soon thereafter sent a resume out to their home office in Englewood, Colorado. A year passed and having heard nothing from ASA, I assumed they were not interested in my services. However, I was contacted initially in April of 1997 by ASA and after a flurry of phone call interviews and one face to face meeting, I was offered the position of Senior Communications Coordinator at " Mac Relay " for the 1997-98 Austral Summer season. Where is McMurdo Station Located? McMurdo Station clings to the bare and windswept volcanic hills on the southern tip of Ross Island. McMurdo serves as the main U.S. Antarctic station, and is the jumping off point for flights going to the South Pole. Located at geographical coordinates of 77°-51' South lattitude and 166°-40' East longitude. Christchurch, New Zealand lies some 2,415 miles (3,864 KM) to the north and it is about 729 miles (1,173 KM) to the South Pole from Ross Island. McMurdo shares Ross Island with Scott Base, operated by New Zealand just a few miles down the road. An active volcano, 12,447 foot, (3794 KM) Mount Erebus looms overhead. A large penguin rookery at Cape Crozier is located at the northern end of the island. There is no vegetation of any kind to be found on the island, Only black volcanic rock and ash share the island with ice and snow. McMurdo Station was first established during the 1955-56 Austral summer season by the United States Navy. Over the years, the station has expanded greatly. 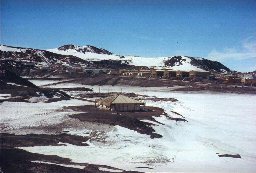 McMurdo serves as the primary staging point for inland station and field science resupply operations. approximately 150 people " Winter Over " during the period from Late February until mid August. During this period of the year, McMurdo is isolated from the rest of the world. Mid August, (When I travelled to the ice) sees several closely spaced " WINFLY " (Winter Fly In) flights which deliver new personnel, supplies and early science parties to the station. The bulk of the personnel arrive on the " Main Body " flights which usually begin in late September or early in October. Station population quickly swells over 1,000 people for the bulk of the summer season. Scientific activity goes on year round on Ross Island. During the time I was there, studies were being carried out concerning the ozone hole, meteorological studies, investigations concerning the Antarctic Codfish, penguins, seals and so on. McMurdo contains a number of historic sties worth visiting. The crown Jewel is Discovery Hut. Located on Hut Point, an easy 15 minute walk from the center of McMurdo, Made of Australian Jarrahwood, and brought to Ross Island in 1902 by the famous Antarctic explorer Sir Robert Falcon Scott, Originally used for such tasks as drying furs, skinning birds, and so on. It was used by a number of expeditions to the area as well. I am one of the lucky people to have the opportunity to enter the hut. Since it's rediscovery in 1963, the hut has been completely restored and is now maintained by New Zealand. Other prominent points of interest on the island are Observation Hill, Vince's Cross, Our Lady of the Snows monument, The Admiral Byrd monument and viewing the soaring peak of Mount Discovery across McMurdo Sound. Getting to and from Anatarctica tends to be a little more complicated than just merely showing up at your local airport with ticket in hand! My journey to the ice began in the middle of August of 1997 when I boarded a plane in Boston's Logan Airport bound for Denver Colorado. The next day, everyone assigned to the third WINFLY flight of 1997 attended a half day briefing session held at a local hotel organized by ASA and National Science Foundation personnel. After flying from Denver to Los Angeles, we all boarded a United Airlines Boeing 747 Jet for the trip across the Pacific to Auckland, New Zealand. After clearing customs, we boarded a smaller jet bound for the traditional jumping off point for all Antarctic travellers, Christchurch, New Zealand. After getting my gear stored in my hotel room in Christchurch, I headed over to the " Clothing Distribution Center " (CDC) to be fitted for my Extreme Cold Weather gear (ECW). Each participant is issued with over 35 lbs, (16 KG) of boots, jackets, gloves, hats, goggles and the like needed to battle the bitter cold of Antarctica. A bit of creative repacking of my gear was needed in order to make the necessary 75 lbs, (35 KG) baggage allowance. Transport from Christchurch to McMurdo for our WINFLY flight was provided by a United States Air Force C-141 "Starlifter" jet aircraft. I spent a little over five hours wedged in between a large amount of cargo, supplies and 80 other people. Fortunately, mechanical malfunctions or adverse weather conditions did not bedevil the flight and we were able to land at the Pegasus Airfield, (First used in 1993, Pegasus is the most distant facility from McMurdo on the blue ice of the Ross Ice Shelf.). Williams " Willy Field " is located 10 miles from McMurdo. A skiway, it is the principle landing area for ski equipped LC-130 Aircraft. From September, until December, Air operations are conducted from the Sea Ice Runway. After December, the ice becomes too soft to support the weight of aircraft. During the Main Body phase of the 1997-98 season, C-141's were used to deliver the bulk of new personnel and supplies to McMurdo at the beginning of the season. We also received several visits from huge USAF C-5 " Galaxy " cargo aircraft. With the arrival of U.S. Naval personnel attached to Antarctic Development Squadron Six (VXE-6) from Point Mugu, California, flight operations switched from jet aircraft to propeller driven LC-130 "Hercules" aircraft. These ski equipped workhorses became the principle means of transport to and from Christchurch, South Pole and many of the larger field camps on the Antarctic Continent (Siple Dome, Downstream B etc.). After serving as the principle means of air transport on the Antarctic continent since 1955-56, VXE-6 handed over responsibility for such operations to the 109th New York Air National Guard at the end of the 1998-99 season. With work going on to expand and improve South Pole Station over the next few years, LC-130 flights between McMurdo and South Pole station will increase dramatically. Twin Otter aircraft are also utilized to serve many of the far flung field camps scattered throughout the continent. A helicopter landing pad located on the edge of the station saw almost constant use with helos transporting supplies and personnel to many far flung locations. Personnel vehicles are not authorized for personnel living and working at McMurdo. However in addition to a number of trucks and vans available for official use, All manner of specialized vehicles are used to reach some of the more remote areas of the island. Tracked vehicles such as snowmobiles, Sno-Cats, Haglunds etc see a great deal of service as well as a number of specialized vehicles adapted just for the Antarctic environment. What's The Weather Like At McMurdo? My first introduction to Antarctica's weather occurred about about 11:00 a.m. on a late August Monday when the C-141 transport flight from Christchurch that I was aboard arrived at McMurdo. After clumsily climbing down the ladder of the aircraft and stepping on the icy confines of the Pegasus Blue Ice Runway, I was greeted by feeble daylight and a wind chill of about -90 ° F. (-68 ° Celsius). During the August-October " WINFLY " period, Wind chills reached as low as -114° F., (-81° Celsius). At those temperatures, one can toss a glass of warm water into the air, and the contents will fall back to earth as ice crystals. On Several occasions during this WINFLY period, Ross Island was lashed by snowstorms with raging winds that reduced visibility to only a few meters at best. Weather conditions remained stormy by the time that the "Main Body" phase of station operations got underway in October of 1997. One October storm brought winds as strong as 78 MPH (125 KPH) at McMurdo and peak gusts to 112 MPH (180 KPH) just 20 miles away at Black Island. During the height of this storm, it was impossible to see more than a few feet in any direction. "Herbie Lines", (ropes with colored flags attached every few feet) were rigged between the Galley and the dorms to allow personnel to safely travel between both locations at mealtimes. As the season progressed, the weather moderated a great deal. By Late December, we had a number of fine days of bright sunshine and temperatures as high as 35 ° F., (+2° C.). Upon my arrival at McMurdo, the region only experienced several hours of daylight. As each day progressed, the amount of daylight increased dramatically so that by the end of October, 1997, McMurdo basked in daylight 24 hours each day. Stepping outside in bright sunlight at 3 o'clock in the morning took a little getting used to. To make sleeping at night a bit more " normal " many of the residents of McMurdo would put heavy blankets over the windows of their dorm rooms to block out the sunlight during nighttime hours. The region continued to enjoy 24 hours of daylight each day until the sun set again for the first time on the 24th of February, 1998. 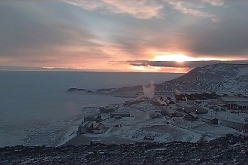 By the end of April, McMurdo was plunged into darkness until the sun would rise again for the first time in mid August. By the time I boarded a LC-130 transport at Williams Field in late January of 1998, there was a definate feel of winter in the air. Not long afterwards, the region would shiver under heavy snowstorms and bitter cold temperatures again. During my six months " On Ice " working at McMurdo Station, I had the good fortune to see penguins, seals and whales up close. Emperor penguins ( left ) are the largest species of penguin in the world. A fully grown Emperor will reach a height of about 39 Inches (99 CM) and a weight of about 66 lbs (30 KG). They are easily recognized by a small patch of yellow next to the white on the sides of their faces. I photographed this Emperor in late September out at the Sea Ice Runway. Adelie Penguins Are easily distinguished from Emperors by their smaller size, different coloring, quicker body movements and voice. A full grown adelie a height of about 28 inches (28 CM) and a maximum weight of about 12 lbs (5.5 KG). adelies were frequently spotted in the area between town and the sea ice runway as well as out at Hut Point. This one was spotted at the helicopter landing pad at about 11 p.m. on January 1, 1998. Other visitors to the McMurdo area were Minke and Orcha (Killer) Whales, Numerous Weddell Seals and the ever present South Pole (Mccormicks) Skua bird. Located on the second floor of Building #165 at McMurdo Station, &Quot;Mac Relay" ,(McMurdo Relay) serves as the primary HF interface between the McMurdo community, other Antarctic stations and field camps, as well as the outside world. Mac Relay shares the facility with "Mac Ops", (Operations), "Mac Center", (Air Traffic Control), "Mac Weather", (Meteorology Department), as well as with the administrative branches of the military units on station. From the arrival of the United States Navy at McMurdo in 1955-56 until the 1997-98 season, Mac Relay was under the total control of Naval Support Forces Antarctica. The 1997-98 season was the first in which the department would be under total civilian control One of my many tasks as Communications Coordinator was to see to it that this transition went smoothly and successfully. The department was made up of five Communications Operators and myself. Mac Relay functions as a 24x7 operation duing the Austral Summer season and a 5x9 facility during the winter months. 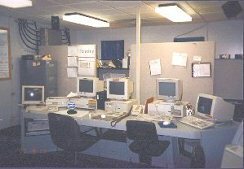 Mac Relay is responsible for a number of communications related tasking at McMurdo. One of the major duties of the department is to provide transmitter/receiver and antenna control and routing for all relevant facilities on station, (i.e. Mac Ops, Mac Weather, Mac Center etc.). 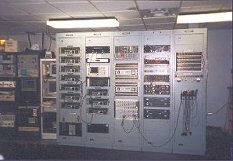 Mac Relay also provided data transmit and receive capability between McMurdo and South Pole Station for the transmission and reception of weather observation message, aircraft departure notices and other data traffic via TDM modem link. All voice and data communications with the USCG Icebreaker POLAR STAR below 60 ° were assigned to the department. All data to and from the vessel was routed via Dovetron RTTY units. Mac Relay communications personnel provided support for the Message Dissemination System (MDS) in place at McMurdo for the routing of military related messages on and off the island. Two separate antenna receiving points were utilized for signal reception. The main antenna/receiver site is located 20 miles away on Black Island. Received signals were first sent via microwave link between Black Island and McMurdo and then onto Mac Relay via telephone lines. Another antenna farm is located at nearby Arrival Heights on Ross Island. Received signals travel via coaxial cable between the antennas at Arrival Heights and Mac Relay. Received audio from Black Island is routed via a Receive Matrix to the desired destination, (Mac Ops, Mac Weather, Mac Center etc.). The input from the antenna farm at Arrival Heights is routed directly to an antenna matrix for chosing the optimum array and then sent to any one of 10 RF Harris Tunable receivers. Receiver output is sent to it's desired destination via the Receive Matrix panel. On the transmit side audio from Mac Ops, Mac Center, Mac Weather and Mac Relay is fed directly to the transmit side of the Transmit/Receive Matrix panel. The Matrix Panel allows the audio to be either sent over telephone lines directly to the &Quot;T-Site" where the transmitters and transmitting antennas are located, or first routed to such devices as the TDM Modems, Dovetron RTTY terminals etc. before being sent to T-Site for actual transmission. Finally, a RF Harris RT-100 transceiver with an output of 100 watts carried out the lion's share of Mac Relay voice communications to South Pole, Field Camps and so on. 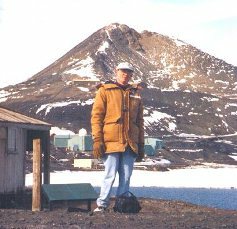 During my six month stay at McMurdo, I lived in a dormintory style building in a tiny room with my assigned room mate Jim Dobbs. Through judicious scavaging, wheeler-dealing and outright chicanery, we managed to outfit our room with a televsion set, VCR and other comforts of home. Working a nine hours a day, six days a week schedule, I was never actually in my room except to sleep at night, or in cases of bad weather. McMurdo offers the resident plenty of ways both productive and unproductive to spend our free time. There is plenty of hiking and cross country skiing to be had, along with sports such as basketball, bowling and volleyball. Since the McMurdo population is about 1/3 female, there is plenty of chance for social interaction at either the coffee house or the two bars located on station. Most evenings I could be found at the coffee house playing endless table tennis matches with my friends from Mac Weather and Mac Center. 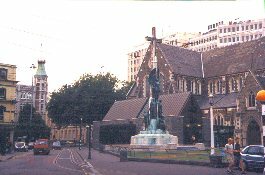 After making the 8 hour flight from McMurdo to Christchurch, New Zealand on the 28th of February 1998, I spent four happy R&R days soaking up the sun of Christchurch. The main city of the Canterbury region of the South Island, "Cheech" offers many attractions for the formerly snowbound Antarctic employee. Leafy avenues, grassy parks, friendly people and interesting historical sites make a few days in this antipode city well worth one's time. ICAIR International Centre for Antarctic Information and Research - Christchurch New Zealand. Mawson Station, Antarctica. Check out the WebCam view! Keith Dreher's Antarctic Travels. Visit Keith's homepage and spend a year on ice with him. Lots of great photos. I worked with Keith during the 1997-98 summer season. International Antarctic Centre. Christchurch, New Zealand. The Antarctic Sun Times Newspaper. Requires the Adobe Acrobat reader to view. Christchurch, New Zealand. Learn more about this friendly city located on New Zealand's South Island.